York Regional PD chose a Freightliner MT-55 forward control chassis for the body of their DUI/BAT vehicle. It boasts a Zone Defense color backup camera system integrated for safety and includes a microphone for spotters and drivers to communicate during backing operations. A private Telephone Booth and Rear Interview room are included in the interior design of this vehicle as well. INTERIOR All cab area windows include blackout curtains. A lavatory with pressurized water system has also been integrated for convenience and comfort. The galley kitchen includes a refrigerator, microwave, and Keurig™ coffee maker as well. Other details include combination carbon monoxide and smoke detectors, a conference table, bench seating with removable cushions, passenger-side workstation with jump seat, a custom fabricated console to house electrical components and control panels, and more. 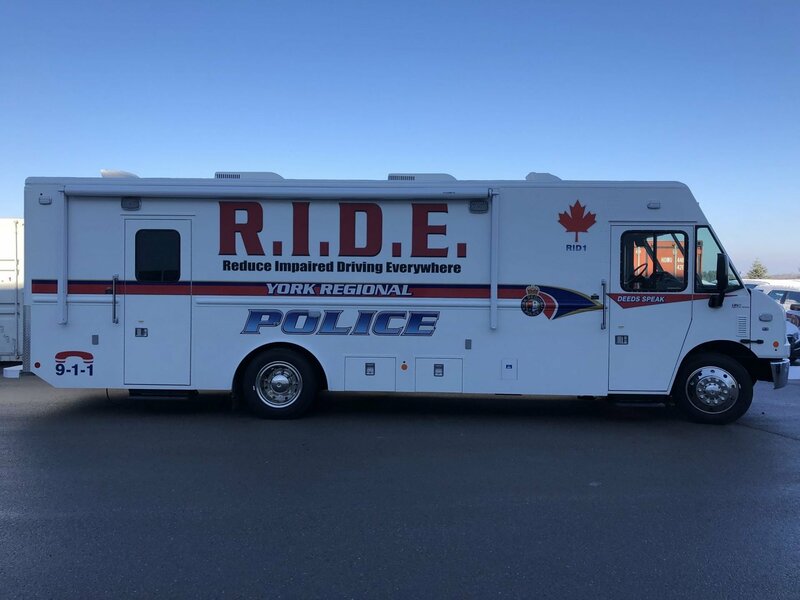 EXTERIOR York’s DUI/BAT vehicle also includes an Onan Commercial Quiet Diesel 12-kW generator housed in a custom fabricated all-aluminum compartment. The Quadra Mfg. Bigfoot™ leveling system is also equipped to level the vehicle when stationed on uneven surfaces. The exterior features on York Regional PD’s vehicle include an automatic steel entry step with LED ground light, Whelen LED scene lights, two ducted Coleman low profile air conditioners, and Dometic Weather Pro awning, among others.